I’ve been chatting with Chawadee this week about restaurants and eateries in Bangkok that serve up quality, tasty and healthy food. Chawadee writes an awesome food blog called Bangkok Glutton and what she doesn’t know about street food in Bangkok isn’t worth knowing. Her book, Bangkok Street Food Top 50, is available through Amazon or at Asia Books. As Chawadee quite rightly pointed out to me, ‘healthy’ food means different things to different people. She defines it as “a lot (if not all) vegetables and cooking techniques that aren’t all about the deep fryer”. So basically natural ingredients that aren’t drowning in oil and fat – sounds good to me! So onto her recommendations for healthy eating in central Bangkok, in no particular order. I haven’t been to these places yet but will make sure I do in the coming months! An organic restaurant that’s hidden away near Rama 4. Chawadee says it’s one of the best in Bangkok, so worth checking out. This review gives good directions and some more information. Another top-notch organic grocer and restaurant that offers a lot of Japanese and international dishes. Organic raw food specialists Rasayana offer treatments and detoxes, as well as a restaurant. They are based in Sukhumvit soi 39 and have a recently opened branch in Emporium as well. Chawadee tells me she “quite enjoys” the food here, so perhaps what they gain in raw health they sacrifice a little in taste? I’ll go and find out soon. Nice to get a street food stall in this list. I’m reliably told their pla luak is great – boiled fish poached in a broth and served with steamed veggies. When many people think Thai cuisine, they think tom yum, and their delicious spicy lemongrass soup with seafood is one of the best in the city. 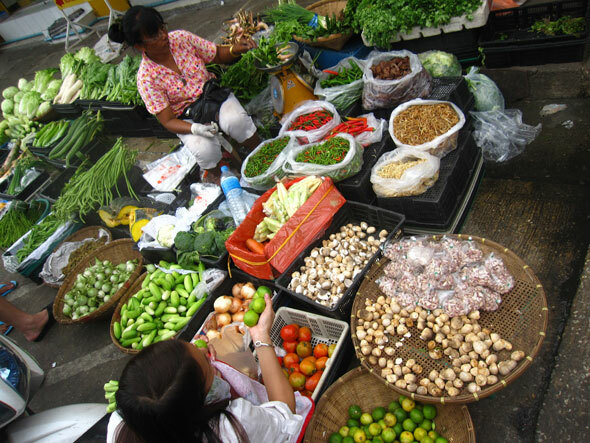 Both dishes use a mix of herbs that Thais consider very healthy. Yum! The last one on our list is more of a takeaway spot than restaurant, so we’ve pretty much got all culinary angles covered in this top 5! They have 5 branches throughout Bangkok, creating dishes with all natural, organic ingredients. Chawadee tells me their nam prik jai (vegetarian chilli dip) is outrageous. So there we have our top 5 healthy eateries in Bangkok. Exploring Bangkok’s huge array of restaurants and food stalls is one of the great ways to get the most out of this awesome city, so give yourself a guilt-free treat at one of these places. Thanks again Chawadee from BangkokGlutton.com for the recommendations… All this writing about food has made me hungry, so I’m off to eat! This entry was posted in Bangkok Specific, Diet and tagged Bangkok, Diet, Nutrition, restaurants by jackthomas. Bookmark the permalink.